Elegante, silenzioso e privato, con vista sui giardini del Sacré Coeur, ecc. Questa particolare zona del Quartiere Latino è una fetta di paradiso culinario. Oh sì, e anche i monumenti di Parigi: Notre Dame, il Pantheon, i Giardini di Lussemburgo, il Jardin des Plates, la Sorbona, la Senna, Boulevard St. Germain, ecc. Sono tutti a pochi passi di distanza. Eppure, l'appartamento stesso, essendo situato in un cortile / giardino dietro la strada, è tranquillo e arioso con vista su alberi e giardini e vari punti di riferimento, tra cui il Sacré Coeur a Montmartre e nelle vicinanze, Notre Dame. Anche se quando gli alberi hanno le foglie, la lettera D è per lo più nascosta in questi giorni. Si trova al piano superiore di un 4 piani a piedi fino (si sa `tipico vecchio edificio Quartiere Latino), ma non appena si varca la porta si è nel vostro mondo di Parigi. No t. v.s o piedi che ti martellano sopra la testa a mezzanotte! E quando esci, ti ritroverai nel cuore pulsante della vecchia Parigi. Meglio ancora, abbiamo 5 fermate di autobus con fermate nelle vicinanze, che ti portano su tutta Parigi - per esempio - il n. 86 si snoda attraverso le minuscole vie della banca sinistra (potresti quasi toccare i negozi adorabili a volte) e circa 20 minuti dopo ti sei fermato proprio sotto la Torre Eiffel. E dall'altra parte della strada c'è il # 67 che attraversa la Senna e si snoda attraverso vari quartieri fino a Montmartre (circa 40 minuti). Molto più economico e più divertente di un bus turistico! Se si ottiene un pass settimanale si può scendere in una zona che si desidera esplorare e poi tornare in un secondo momento. Un tale modo piacevole per conoscere Parigi. C'è supermercato dall'altra parte della strada, aperto fino alle 10:00 tutte le sere (tranne la Domenica). E, in aggiunta alle panetterie ci sono bei negozi di alimentari a sbavare ovunque ti giri. È quando apprezzi le scale !! Ci `sa caffè molto cordiale in un angolo, Le Petit Cardinale, dove è possibile andarci a quello che di fantasia dalle 8 fino a mezzanotte tutti i giorni. O semplicemente sedersi fuori e guardare la gente per ore.
Ha una camera, ma ospita 3 persone comodamente. Nel bagno la doccia è attaccata alla parete sopra la vasca. Vi è anche un bidet. Ho tonnellate di libri, tra cui guide, una selezione eclettica di CD. e un portatile Apple con connessione wi-fi. Oh, e TV con CNN, BBC news, etc. Trovare un posto in affitto a Parigi può essere scoraggiante in quanto vi è tanta scelta online in questi giorni, in parte un po 'fuorviante, quindi è necessario essere diffidenti, e se avete domande è consigliabile prendere il telefono e chiama il proprietario. Questo può essere un viaggio speciale per voi, un anniversario forse, e si vuole essere sicuri di trovare un posto dove stare che vive all'altezza delle vostre aspettative e vi migliorare la vostra esperienza a Parigi in modo da avere i ricordi per tutta la vita. In questo caso, questa è la mia casa, e ho impostato di conseguenza, quindi ha i comfort e l'atmosfera di una vera casa, non una unità di noleggio. Vengo da San Francisco per 4/5 mesi all'anno e porto qualunque comodità che trovo carente a Parigi! Se pensate che il mio appartamento potrebbe essere una buona misura per voi, appena e. mail me con tutte le domande, e non esitate a chiamare anche me. (415) 533 8871. We enjoyed our stay very much. The neighborhood is delightful, near many famous Paris sites, but also an authentic Paris community. The residents and shopkeepers couldn't have been more friendly. Also very near two Metro lines as well as bus routes. We arrived in Paris very early on a Saturday morning, and the apartment was available for check in at noon. We were able to drop our luggage earlier, and explore the area without having to drag our bags. Diane greeted us and showed how everything worked, and was very responsive when we had questions. The apartment is charming. It was nice to have a living room to relax each night when we came in from our excursions and the kitchen is quite well equipped. We especially liked being able to make our coffee first thing each morning. We had a wonderful stay, and can't wait to come back to Paris. There is so much to do, and never enough time. Sincere thanks to Deirdre and Diane for their hospitality. They are truly caring and considerate hosts. We absolutely loved our stay at Deidre's apartment! 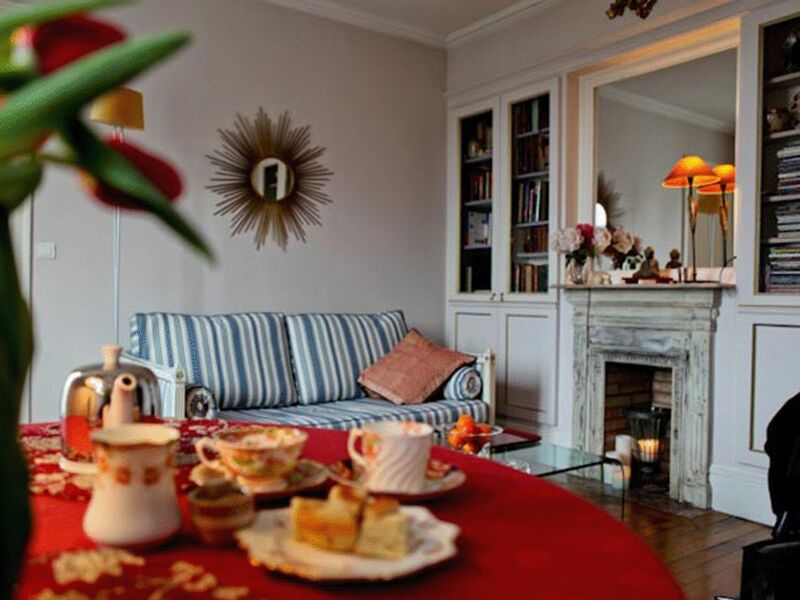 It is absolutely perfect for the two of us with all the amenities that you would need for a lovely stay in Paris. Diane was a welcomed site upon arrival with great tips on how to make our vacation easy and fun. The location is super convenient with 2 Metro and bus stops just steps from the door that can take you anywhere you want to go. There are tons of options for local cafes and markets to stock up on your favorite foods if you decide to eat in or dine out. Kitchen was very well laid out with all the utensils if you do decide to eat in. Wifi was great! As for the accommodations, the apartment is small but perfectly laid out with plenty of shelves to fully unpack and settle in. The bedroom is very comfortable and quiet with a full king size bed and blackout shutters for a very restful sleep. Beware of the stairs up to the top floor as there is no elevator. It was only a struggle upon arrival and departure with our luggage and was actually very helpful to work off the days eating adventures each day. We would definitely recommend this charming apartment and hope to return soon! The apartment was magnificent!! It was in a beautiful area of a Paris overlooking Notre Dame. Deirdre was wonderful in providing all the information we needed. She arranged a greeter Ken to meet us at the apartment to give us an overview of how everything worked and general information about the area. I highly recommend this apartment. My husband and I would love to return. Well we enjoyed having you and your husband stay. You were delightful guests in every way and it was a real pleasure to do business with you. I`m so glad you were happy in the apartment. Deirdre arranged for us to be met both arriving and leaving the apartment which was a great help after a long flight. On leaving, we were able to put our bags at the top of the stairs outside the apartment door as our flights home were late evening. It was completely safe leaving them there.The apartment is truly charming, the bed very comfortable, the kitchen very convenient. It was a joy to look out the windows overlooking Notre Dame each morning after a very sound sleep. Couldn’t be better located for the boulangeries, the markets and the metro, though we walked nearly everywhere. The bath was a plus for soaking tired feet and body. Christmas Eve in Notre Dame was a treat as we arrived after the crowds had already entered. What a surprise!!! I would highly recommend this apartment for a good weeks stay in the city. I hope to return in the somewhat near future. Saira was a delightful guest in all ways, but particularly helpful to me was her understanding about needing to leave the apartment by 10am, as there were guests arriving the same morning. Normally guests can just depart at whatever time their flight or train requires. But she was totally accommodating and they simply left their bags outside the apartment door (being on the top floor is an advantage in many ways, this being one!) whilst the housekeeper cleaned and prepared for the next guest. I am so happy that Saira & Dereck enjoyed their Christmas in Paris, and the apartment. My wife and I stayed for a little over a week here and it was absolutely perfect for us. It's just off the beaten path enough to be a quiet getaway, but SO close to everything you want to do and see. Literally a 5 minute walk to Paris' 2018 best-rated croissant! And obviously Diane and Dierdre are wonderful hosts and we couldn't possibly have felt more welcome or at home. We can't wait to come back! This is the way to experience Paris as someone who lives there would. The neighborhood is perfectly accessible to the entire city. The apartment is fine for two people. It offers privacy, the sounds of school children in the morning, elegance and a nice kitchen, bathroom, bedroom and sitting area and a wonderful view both during the day and at night. My wife and I would stay there again and are already planning when! Rate based on a 2 person occupancy 25 dollars a night for 3rd person Low season rate available - please inquire Cancellation policy - Once the period is blocked on the VRBO calendar the payed amount is not refundable, but a good faith effort is made to find a replacement renter in order to return as much of the funds as possible. This may require offering a discount if it is very short notice.